The Empire State Building is not only one of the most iconic buildings in the world, it’s capped by one of the most significant technological innovations in broadcasting – the Alford antenna, the master FM antenna that was erected nearly 50 years ago to serve the area’s broadcast market – the largest in the United States by audience size. As the Audio Engineering Society recognizes this milestone with a special 50th Anniversary celebration at the Building on October 29, a rare honor will in turn be bestowed on the AES, as the building is lit in the signature AES blue and white to acknowledge the opening of the 139th International AES Convention and its remarkable members, engineers and audio experts who continue to innovate. On Thursday, October 29, from 6:30 – 9:30 pm, the special celebration will take place in the Empire State Building’s 67th Floor conference room, jointly produced by the AES and the Society of Broadcast Engineers (SBE). David Bialik, chairman of the 139th AES Convention broadcast and streaming program, and Scott Fybush, Broadcast Tower aficionado and an expert on the site, will host a presentation covering the technology behind the Alford antenna and moderate a broadcast industry all-star panel of innovators, engineers and radio station personnel who serve the millions of listeners in the New York Tri-State region. The presentations will focus on the Empire State Building's Master FM antenna from design concept with Andy Alford and Kear and Kennedy through to today's remarkable FM Empire State Buiding systems that now include 19 FM stations. 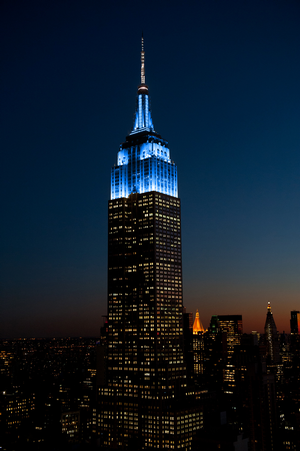 “The installation of the Alford antenna in 1965 was one of the most significant milestones in broadcasting history, and we are proud to present this distinguished panel and to be honored with the lighting of the Empire State Building on October 29 in the emblematic blue and white AES colors also commemorating the start of the 139th Audio Engineering Society Convention,” said David Bialik, Broadcast and Streaming Media Track Chair. Before the Alford antenna ringing the Empire State Building’s 102nd floor observation gallery went into service on December 9, 1965, only one station at a time could broadcast from one antenna at a time. The invention of the combined master antenna system embodied in the Alford antenna allowed multiple radio stations to broadcast from a single antenna array, saving space and cost and marking a revolution in FM broadcast technology. Today’s combining systems have improved over the last 50 years and now accomplish superior propagation of radio signals to the largest listening audience in the US. The Alford antenna was the model for subsequent master antenna sites in Toronto, St. Louis, Houston and Minneapolis-St. Paul, and eventually even back at the Empire State Building, where a new master antenna system was commissioned in the 1980s. The original 1965 Alford antenna continues to serve as a backup and was pressed into service after 9/11 to provide emergency replacement antenna capacity for stations that were displaced from their World Trade Center sites. Today, the new Master FM antenna systems reach the most listeners anywhere in the world, and is the largest sophisticated FM combiner in the western hemisphere. Because of space limitations, reservations to the event are required and will be on a first-come, first-served basis. Tickets will be available for registered AES attendees on Wednesday, October 28 (3:00 – 7:00 pm), and Thursday, October 29 (8:00 am – 1:00 pm), only on-siteat the Tech Tours desk at the 139th AES Convention in the Jacob Javits Center. Additional information about the 50th Anniversary event honoring the master FM antenna at the Empire State Building is available at http://www.aes.org/events/139/specialevents/?ID=4629.